In the 2014 Charles David Keeling Annual Lecture “Getting serious about climate change”, Professor David G. Victor discusses the transitions in the public narratives on atmospheric and environmental global climate change, noting the transition of the focus from detecting and attributing the causes of climate change localized in scientific intellectual communities towards managing the politics, communities, and impacts of environmental degradation. The lecture focuses on the societal practices required to manage and overcome the political barriers assuming that a two degree increase in global atmospheric temperature change is no longer preventable. The lecture focuses on the climate change that results from the buildup of carbon dioxide and other greenhouse gases. The first takeaway is that there is undeniably an “observable human signature” on our current climate change. 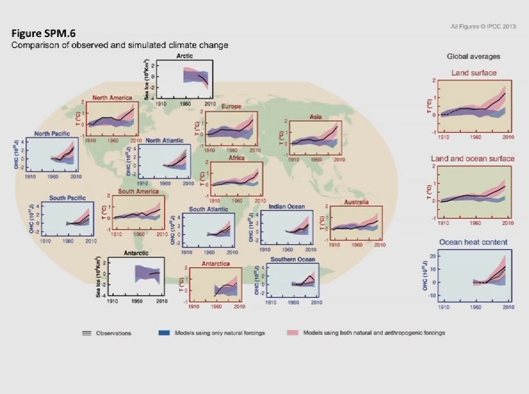 While there is reliable data and measurement in a variety of ways of the build of carbon dioxide (e.g., atmospheric C02, Surface Ocean C02 and pH), the models and projections are unable to explain the observable changes in the world without the account of the buildup of greenhouse gases into the projected models predicting environmental climate change. This very fact signifies not only a confidence in the projections themselves but also provides the scientific basis to say that the warming of the atmosphere from the 1950s onward has been caused by human beings. The second takeaway is that the global climate change problem is not exclusively a problem of the buildup of C02 carbon dioxide emissions. 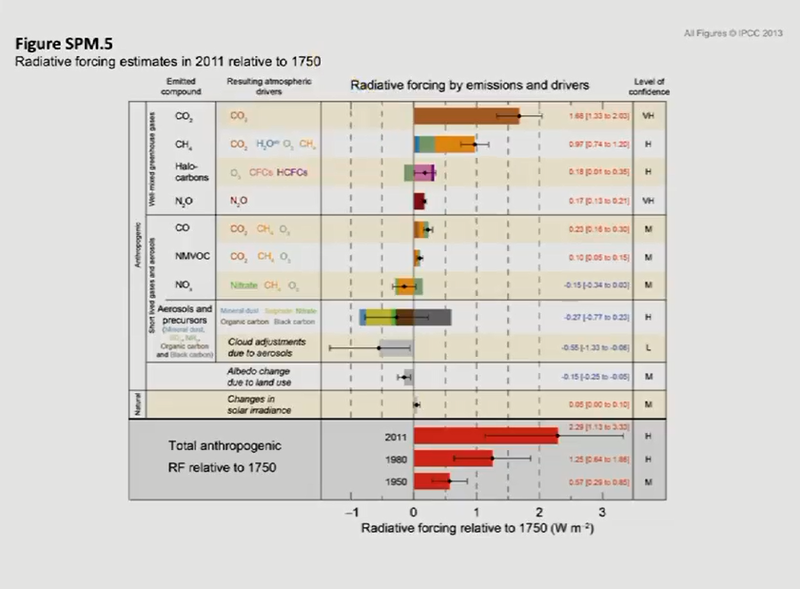 The research above demonstrates the buildup and the impact of emissions of other greenhouse gases. While we can certainly say that carbon dioxide is the most complex and long-term affecting greenhouse gas causing climate change, in large part because of its inherent interconnection of modern economies, there are other greenhouse gases with varying short-term and more local political dynamics. This is significant from a political science perspective because it can facilitate efforts and coalitions mitigating and managing environmental degradation. The scientific data as shown above provides a visual window into the range of what Dr. Victor calls the “human uncertainty” – the inner-bounds range representing the uncertain of our socio-economic responses – in contrast to the outer-bounds representing the “natural uncertainty” corresponding to our responses. The third takeaway is that there is a need to expand research on the impacts of climate change on human ecosystems to the impact of climate change on natural ecosystems. We need more research on “where” and the “how” to “intervene in nature to help control and help nature to adapt” to climate change. It is one step in rethinking how we protect our symbiotic ecosystems. There are a few reasons, Dr. Victor argues, that explain why communities of nations have not been successful in addressing climate change and its contemporary politics while emissions have been steady inclining. The main reason is that while there are international treaties, Kyoto protocol, international meetings and conferences, countries today have the ability to “pick and choose” the international obligations they sign up. The other problem is that the rise of globalization has enabled high emitting countries to outsource their emitting industries; or in other words, our current global systems have permitted where countries that have controlled their emissions to also have had their industries migrate outside of their borders to other regions in the world (e.g., the migration of the steel industry). Third, the nature of the problem itself is also complex. Human beings do not adapt well to problems that do not visibly manifest themselves and that also slowly build up over time because these types of problems require addressing short-term costs today for long-term uncertainties and the redistribution of benefits to into the future and other regions. We can also fully exploit the “fortuitous” accidents (e.g., technology and low costs of natural gas) to put into place regulative frameworks and policies. 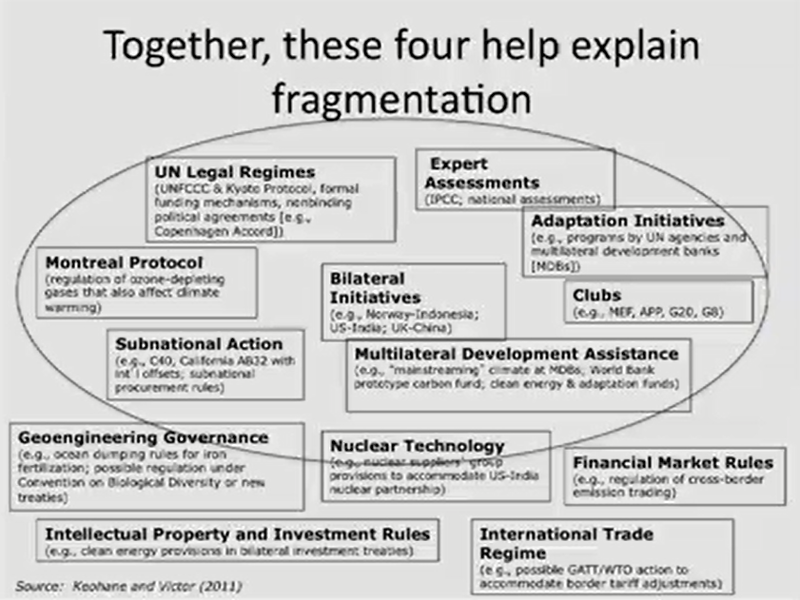 As the preceding image demonstrates, it is important to remember that solutions and the “policy landscape” on climate change is “highly fragmented” – it cannot always be a UN treaty. Sometimes it is a “complex mess”. It is important however that solutions incorporate incremental results because success in some areas will lend credibility in a way that is immediate and very much needed at this time. 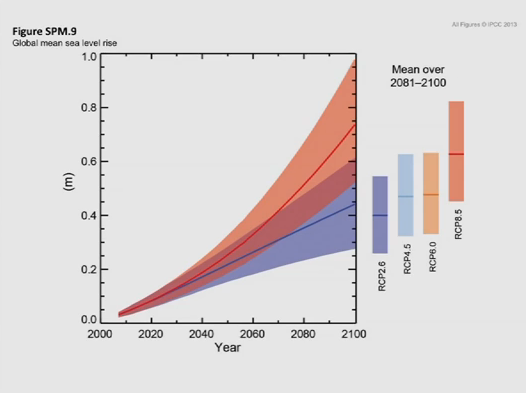 You can access here the latest IPCC Fifth Assessment Report for more information on the data and research.